Goodwin, Harold L. Illustrated by Geary, Clifford. 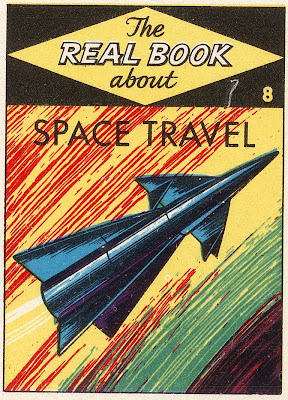 The Real Book about Space Travel. New York: Garden City Books. (192 p.) 21 cm. This one covers basic theory of spaceflight, conditions in space, planned manned exploration of space, and conditions found on other planets. Illustrations are charming, with drawings of rockets, astronauts, space stations, and a manned landing on the Moon. 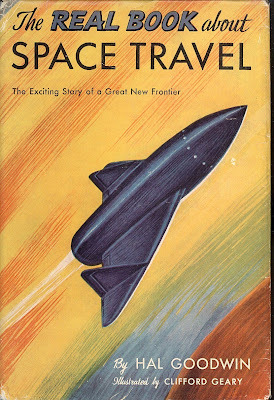 One of the most popular juvenile space books" of the 1950s. "Real Books" series (#33). Also 1956 edition. For an extra treat here is the "book stamp" that you could use to order the book as part of the "Real Book About" book club. It has a slightly different space ship, doesn't it? Astronomy (1963) "Whitman World Library"